Real estate development is essentially a math problem. How a development looks and functions is conditioned by the limits of engineering and zoning, financing, and what revenue can be generated when construction is finished. Rents, for example, are set by what people are likely to pay and how much money needs to be generated each month to cover debt service. Like any other business, real estate development can be a risky proposition with marginal profits. Generating the capital for new projects is usually a challenge, especially for innovative projects. In the end, all the numbers have to add up so that costs are covered by revenue. What if everyone could participate in the real estate development game? What if the overall financing of a project depended significantly on money raised from people most interested in what the building looks like and how it functions because they live near by? What if building new projects, and the risks associated with them, were shared by private developers and people in the community? The Ethical Property Company owns and operates 15 centres across the UK, providing 15,000 sq m/161,000 sq ft of rentable office, event and retail space to charities, social enterprises, voluntary and campaign groups. We also provide management services to other like-minded landlords and are currently responsible for the operation of an additional six centres across the country. In total, we support over 230 organisations as tenants while over the last year an additional 460 organisations have taken advantage of the meeting and conference space within the centres we manage. I know, I know, it’s another country and they spell funny and all that. But the idea is one that really makes a lot of sense. Why hasn’t it happened in the United States? Well, someone is trying. Fundrise is a new Washington D.C.-based venture that is trying to create what amounts to a small-scale Real Estate Investment Trust (REIT) in which investors can put money into a real estate project and reap some of the financial benefits from success. A typical REIT is gigantic, with hundreds of millions of dollars in real estate equity not to mention, sometimes, millions of square feet of land or space. Plum Creek timber is a REIT and so is Shurgard Storage. Fundrise is a rather modest venture by comparison, and is an LLC, not a REIT. They’ve raised $203,500 from 121 investors (who have to be from Virginia or DC) with a goal of raising $325,000. The investors will own about 28 percent of the project with the rest being held by a private LLC. That means that the project costs are in the $1 million area. A lot of people would scoff at $325,000. “Not a lot of money,” they’d say, “for a large project.” And it is true that there would be a lot of overhead to manage the contributions, thank investors, deal with the Securities and Exchange Commission and figure out payments to hundreds of small-bore investors. It’s an important start to prove that it can be done. 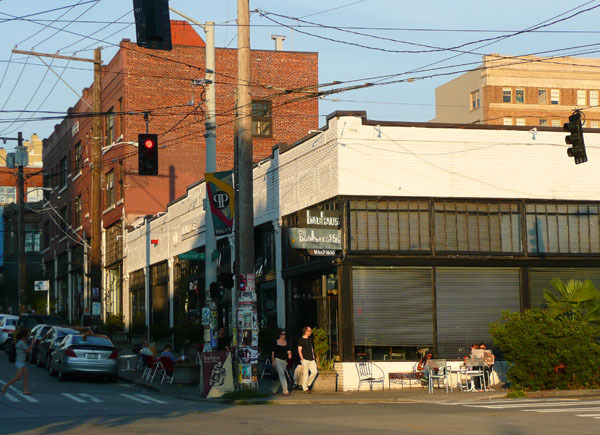 Community investment in real estate is an idea that I proposed earlier this year when there was a big dust-up over the possibility that Capitol Hill icon Bauhaus Books and Coffee would be a casualty of mixed use development. The Bauhaus panic inspired a wave of hyperbole from Capitol Hill Seattle Blog, which blustered about the coming of Eastside developers and the end of life as we know it on Capitol Hill. We should put that energy into building a financing vehicle to share some of the risks and benefits with developers. Instead of cursing the private sector and real estate market we should use it to benefit a broader span of the local economy and give everyone—not just single-family homeowners—the chance to cash in as growth increases property values over time. Roger Valdez is a Seattle researcher and writer. He read through Seattle’s land use code and blogged about it. He currently directs housing programs at a local non-profit. I really like where you’re going with this Roger. We love the idea of local food, local crafts, and local business, so why not local development? We should always be looking for new ways to get people involved in the changes taking place in their neighborhoods, and this is certainly a great one. In some ways we already kind of have this, right? Nonprofit groups like Historic Seattle (technically a PDA) and Capitol Hill Housing are funded primarily from local donors, and their goals are to create (or preserve) community assets (ei. buildings) that respond to neighborhood needs. The 12th Ave Arts building and Washington Hall are good examples of this. Adding a similar for-profit model would be great too. It brings to mind something like the Skelly and Bean start-up idea, or on a larger scale, the PCC or REI co-op model. You start a development firm with the exclusive intent of developing neglected properties. My guess though would be that rates of return would be pretty low, since you would assume that a larger development firm would snap up any property with a lot of potential. Then, with today’s innovative tools for raising money, maybe you could secure enough resources to compete with the big dogs. Let me know if you move forward with this. I’d welcome the opportunity to invest in local real estate with a small investment. It’s something that every homeowner has done, in a different way, and can result in some strong incentives. The strong political force of NIMBYs is really just a group of people looking after their own interests and property values. If we had a similar group of investors working on the other side, these forces might just balance out. This exists on a much more broad scale. You can already invest in a REITs that do a lot of business in Seattle. That said, a small investor will never have a voice in large REIT but could really be heard in something smaller. I think that in most cases it is true that the “NIMBYs” are “looking after their own interests and property values”. And, I would argue, that they are often found in opposition to development that does not conform to the greater needs of their community – often expressed as those same interests. It is just these NIMBYs that are the candidates to participate in this type of local community development. To suggest that community funded development is somehow in opposition to NIMBYs misreads the general tenor of what community struggles are about. Allow me to add another voice saying “count me in.” I’m eager for ways to invest in my neighborhood. We are also very interested in trying to figure this out in the Central District, particularly along Jackson Street. It seems to us, that being so close to the city, we’re going to see a huge influx of new development (which we need) along Jackson, but are trying to figure out how we can help ensure that’s it’s not soulless and totally corporate-dominated. We are on FB: Jackson Commons Seattle + the web. We would love to talk with anyone interested in development on Jackson Street. We’re trying to get a standard meeting room set up to run a lecture series on development in the New Year…and have a community meeting on Nov 13 at Douglas Truth, which we would be happy to give part of that time to someone else to discuss NREIT ideas and how we can implement. Looks like crowdfunding will build the tallest building in Colombia. How about this for crowdsourcing. Not a funding model, but absolutely pulling ideas from the community for development.